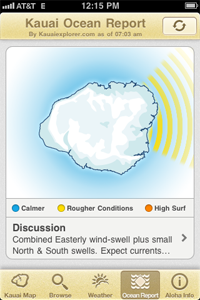 "In the spirit of Aloha, providing excellent beach information to aid in the safety of our visitors." 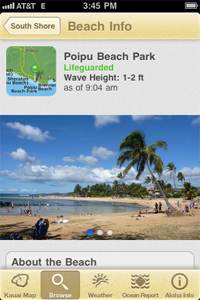 The most comprehensive iOS & Android app for Kauai's beaches. 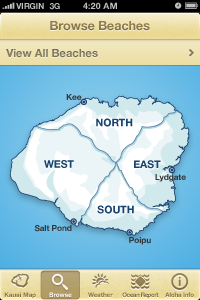 Find your perfect beach using the Kauai Beach Guide. The fully interactive GPS-enabled map, filtered searches, detailed beach information and up-to-date ocean and weather reports make this simple, quick and stress-free. 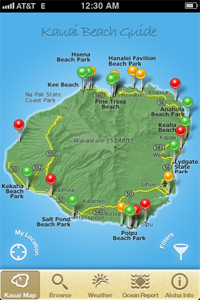 Kauai Beach Guide offers comprehensive information to help you find the safest, most tourist-friendly beaches on the island. •	Fully interactive, GPS-enabled map. 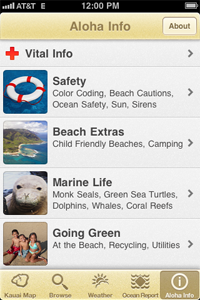 •	Filtered searches based on safety, child-friendliness, amenities, swimming, snorkeling, and bodyboarding. • Daily wave height updates, weather for each coast, and also any ocean advisories. •	Special color-coded pins tagging which beaches are lifeguarded, which are generally safe under good conditions, and which call for extreme caution. •	Instant access to general beach information, as well as parking, campgrounds, and two of the most stunning coastal hiking trails. •	One-tap access to driving directions from your location. •	Learn about local marine life, history, and nearby points of interest. •	Find out how “going green” during your stay helps preserve Kauai’s beaches and keeps them beautiful for future visitors. • Vetted by local lifeguards and Dr. Monty Downs of the Kauai Ocean Safety Task Force. © 2016 Kauai Beach Guide All rights reserved.